When it comes to being a parent and especially a new parent for the first time, putting your little one to bed can be quite problematic. Most of the time, the majority of newborn babies will wake constantly during the night in the beginning, and although this is perfectly normal, it can make you feel like you are doing something wrong. These early stages of being a parent can be quite stressful as sleep is lost, and tempers rise, but luckily there are options out there which can really help you out. One of those options is a white noise machine which has been scientifically proven to help babies when it comes to sleep. 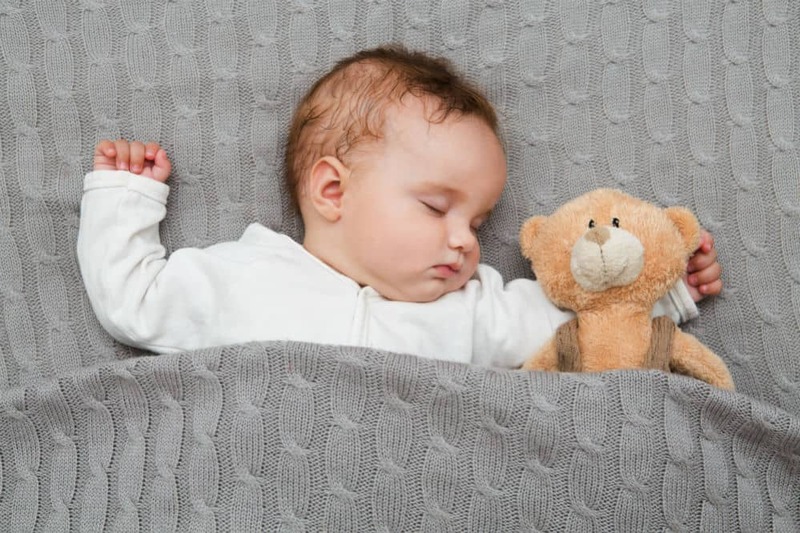 In this article, we look at five of the best ones on the market, so hopefully, you and your baby can get a better night’s sleep in the future! If you are looking to create an ideal sleeping environment for your little one, then Big Red Rooster will help you do just that with their baby sound machine. The next fantastic white noise machine on our list is the baby sound machine by Big Red Rooster. This noise machine is specifically designed for babies and comes with six high-quality lullabies. The best thing about this white noise machine is the soft, sweet songs it comes with. This includes rock-a-bye, twinkle, ocean, white noise, and even the sound of a heartbeat! This is the best method for helping your little one to snooze off after you leave the room. As well as being filled with a mix of great sounds, the Big Red Rooster sound machine is perfectly portable, meaning it can easily be taken anywhere, even on vacation, so your baby is guaranteed a good sleep wherever you both are. Although this baby sound machine comes with a range of sounds, many people have complained that their overall sound quality is questionable, and also features looped sounds rather than non-looping. Marpac has been helping people to sleep better since 1962, and are certainly experts when it comes to sleep! They believe that white noise can be a lot more effective than a simple lullaby; therefore, their high-quality product features three soothing sounds which are extremely sleep promoting for babies. 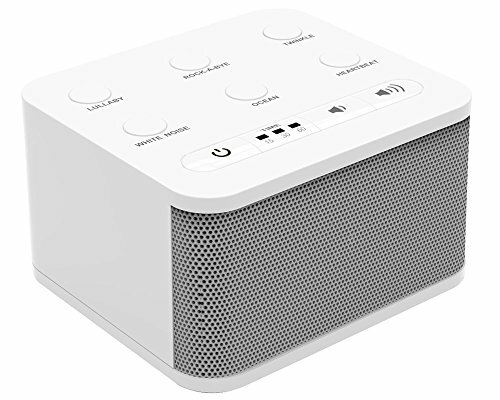 This product has been created by true sleep experts and so you can expect a good quality white noise machine, that will do the trick when it comes to bedtime. 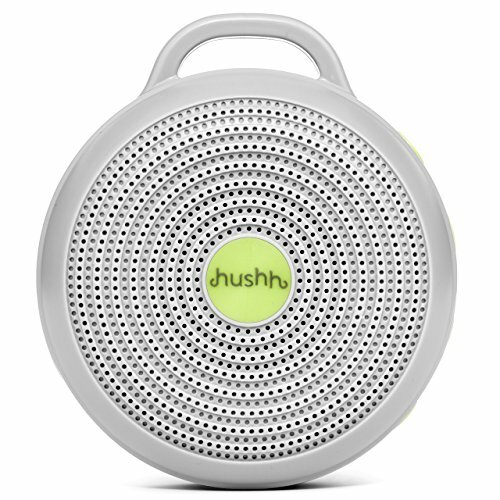 This white noise machine features a lithium-ion battery and can recharge from a micro USB which is included. 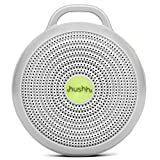 The Hush baby sound machine is so small and compact it can easily fit in your bag and be taken anywhere, to make sure your little one can sleep soundly wherever they are. The machine offers three different sound options which includes white noise and deep white noise, or a soothing surf sound which has a diverse volume range. Although this product is highly rated, a few customers have complained that the charge does not last a full 8 hours, which can be a bit of a problem, especially when keeping it on all night long. Some people also commented hearing a strange background noise in the machine, which is also not pleasant. The final white noise machine on our review list is by HoMedics, who are experts in innovative wellness products, and their white noise machine is no exception. 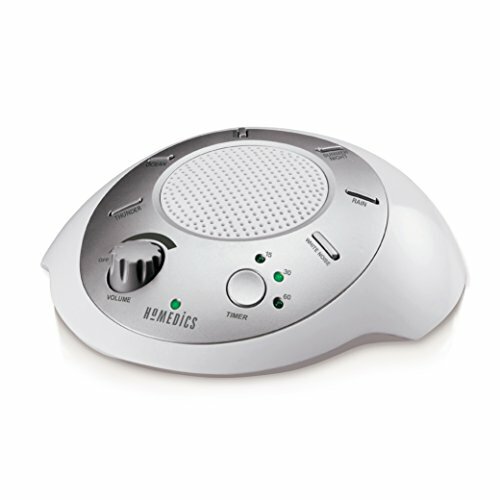 The HoMedics white noise sound machine is perfect for both baby and adult alike. Featuring a variety of six different sounds to choose from, you can always have a new sound to listen to. These sounds are guaranteed to help your baby sleep better with the SoundSpa’s rhythmic tones which help induce a sense of relaxation, calm and peace. With an auto-timer, you can choose to either play the relaxing sounds continuously or pick a set time for them to finish. The HoMedics machine is also super lightweight and easy to carry, making it perfectly safe for travel! The HoMedics machine has been said to stop working not long into ownership, and at around the 3-month mark, many customers complained it stopped working completely. Some also complained of static coming from the monitor. The Palermo is currently unavailable on Amazon so in its place we recommend the Marpac. If you are looking for a better night’s sleep, then Palermo has got you covered. Not only will they help you to get a good night’s rest but also your little one too, as their machine includes beautiful lullaby sounds. The Palermo sound machine is a great little machine for helping you get more shut-eye. It features two shut-off timers meaning you can leave it on while you relax, with no worries of having to get up and switch it off. This is perfect when leaving in your child’s room during the night. It also blocks out any disturbing noise which is perfect for staying relaxed. The lightweight and compact design of this sound machine also makes it a great option to take out and about with you and your baby, so you can always soothe your little one when required. The Palermo white noise machine features 10 soothing, all natural sounds, which feature brown and white noise, nature sounds, birds singing, ocean waves, rainfall and soothing lullabies perfect for helping your baby sleep more soundly. Some customers, unfortunately, complained that the device stopped working not too long into ownership. Others also experienced minor problems with the volume, stating that the sounds weren’t loud enough in some cases. 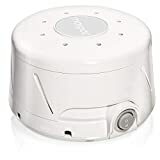 We truly believe that the best white noise machine for baby is the Big Red Rooster white noise sound machine, as it features a selection of all natural sounds! It also has a very nice design aspect, making it perfect for baby nurseries and for adul rooms alike. If you are shopping on a budget, however, your best shot is probably the white noise machine by Homedics as it is a little cheaper in comparison to the other four options. This also features a great range of noise masking sounds as well as an auto-timer. So there you have it! Five different varieties of white noise machines which are all capable of giving you a better night’s rest. If you haven’t got your hands on one yet, then what are you waiting for? if your baby enjoys a good night’s sleep, this means you will too.